Georg Arthur Jensen was a Danish silversmith. Born in 1866, Jensen was the son of a knife grinder in the town of Raadvad just to the north of Copenhagen. Jensen began his training in goldsmithing at the age of 14 in Copenhagen. 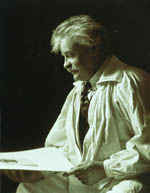 His apprenticeship with the firm Guldsmed Andersen, ended in 1884, and this freed young Georg to follow his artistic interests. From childhood, Jensen had longed to be a sculptor and he now pursued this course of study at the Royal Academy of Fine Arts.